I’ve always wanted to try out one of Cinema City’s Cinemama sessions at Palac Flora. This is a special screening for parents with small children - noise, mess and stumbling around in the dark are all encouraged! As Ari turns 18 months this week and as Cinemama is from birth to 18 months it was my last chance to go. The extra incentive was the feature Eat, Pray, Love. Like many I’ve read the book and love to travel so when stuck with child one can ‘armchair’ travel and enjoy the cinematography unfold on the big screen. Well, that is if one is without a toddler… mums with newborns and even crawlers were quite happily seated and enjoying the feature, me on the other hand spent quite a bit of time chasing my active lad up and down the stairs, out onto the front floor and into the entry corridor numerous times. Cinemama is at Cinema City in Palac Flora on the edge of Vinohrady. You purchase your ticket and your child is free, the price is 169czk which I think is pretty much the standard price you pay at multiplex cinemas these days. A bonus is a two for the price of one coffee voucher for Costa Coffee one floor below. Once you enter the cinema you will be given two tickets - one for your pram and one for you to keep so you can claim it when the movie has finished. You will be directed to 1 of 2 cinemas where you store your pram before heading to the main cinema. The cinema really was something to behold, held in the largest room it was a hive of activity prior to the film. 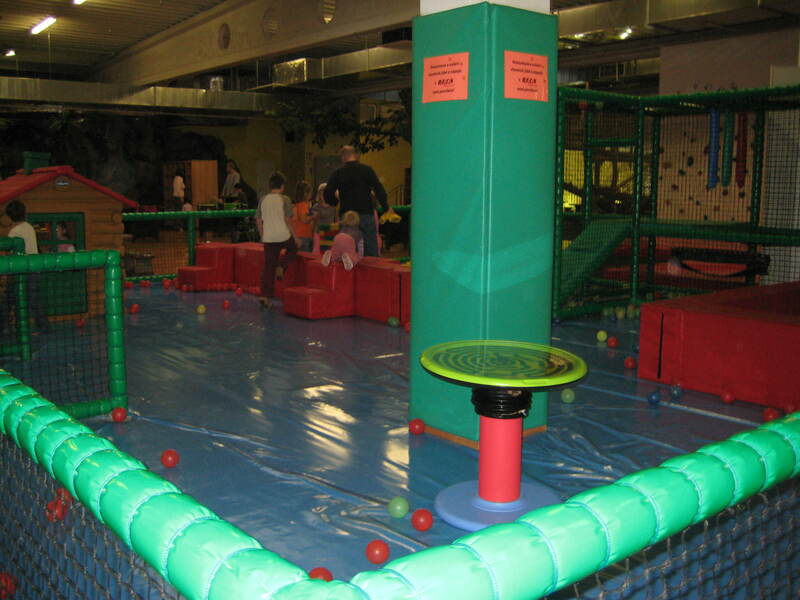 The large area in front of the screen had been covered in blankets and a good assortment of toys were left out for kids to play with. 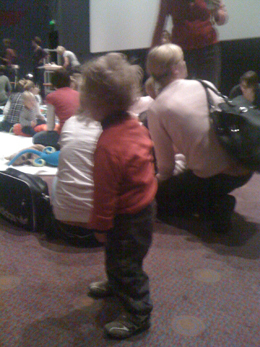 Three nappy stations were set up and mums were kept busy throughout the movie using them constantly. I found this sight quite amusing but typically Ari decided to stink out his nappy and I was forced to join them mid-film and in semi darkness had to clean up a dirty bottom - quite fun, not! 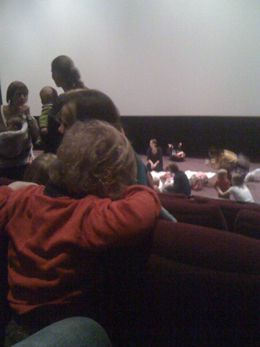 Initially crawlers and their mums were down the front on the blankets but as the film continued many of these crawlers began their morning sleep in portable car seats or mum’s laps. Toddler kids then started wandering down from the seats and began playing with the toys. Around this point Ari decided this area was more interesting than the film (and he’d eaten all the snacks that I’d packed) so I ended up sitting on the floor rolling a ball back and forward to entertain him for around 30+ minutes. Mothers are such wonderful multi-taskers so it is possible to enjoy this experience whilst attending to your young offspring. But… given Ari’s developmental stage, the length of the film (2.5 hours!) and the ongoing noise I found the experience only marginally better than a long-haul flight to Australia. Interestingly, out of the many, many mums in attendance there was not one male parent/grandparent present - did they know better? Cinemama also runs in Pardubice and Plzen. Cinemama’s next film will be Já, padouch (Despicable Me) screening on 8 December at 10am - as this is a children’s film the session is open to kids of all ages. Be warned though, as it’s a kids film it will be dubbed into Czech. The following feature in January is Rodinka (Family) which will also be in Czech. So if you’re Czech isn’t so hot it’s probably best to wait for an English feature (which will also have Czech subtitles - very handy when kids are exercising their lungs). Cinemama screens a feature every month, their program is advertised on billboards within Palac Flora and advertised on Cinema City’s website so keep a look out and let me know how you enjoy it! 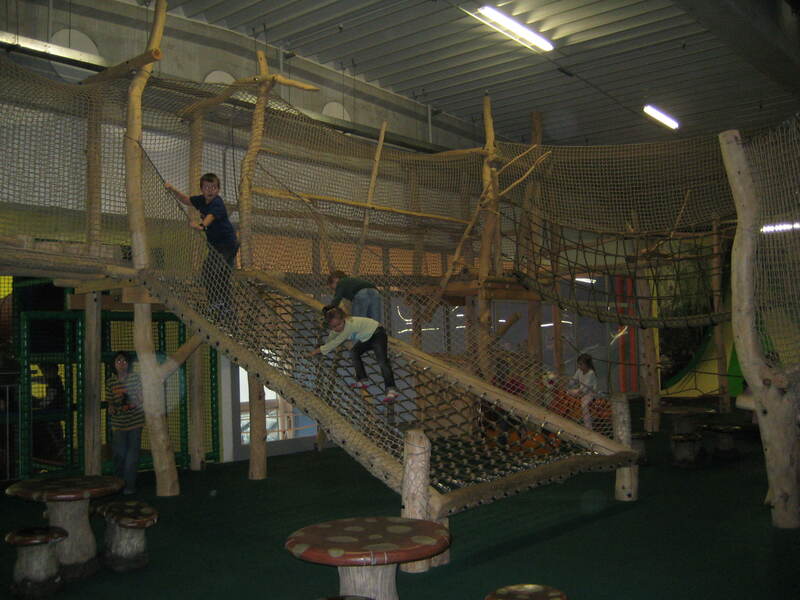 PS Sorry for the bad quality photos - it was difficult to capture given low light and fast moving children! DIRECTIONS: By Tram take 5, 10, 11 or 16 to tram stop Flora or Bus 136 to bus stop Flora. By Metro catch the green A line to metro stop Flora, at the top of the escalators there is an entrance on the right that leads straight into the shopping centre. By Car: Palac Flora has free parking for 1 hour on the weekdays and 3 hours on the weekend, additional hours are charged at 50CZK/per hour. If you buy something in the mall for over 100kc or have a cinema ticket you will get 3 hours free parking but you will need to present your receipt and/or cinema ticket plus parking ticket to either reception on the 3rd floor, the kiosk of Lifefood on the 1st floor or the KMP Carwash on 2nd floor.